The IG Magazine is much more than a who's who of Italian Greyhounds. In every issue (7 per year) there are fascinating articles about a wide range of topics relating to the wonderful world of Italian Greyhounds. Every issue is also chock full of breathtaking IG photos. 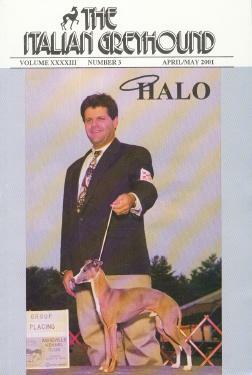 For those who love Italian Greyhounds in all sizes, shapes and colors....this is THE MAGAZINE! Subscription Rates $30.00 per year for 6 issues. Optional First class rate is $43.00 in US only. Airmail rate (Foreign) is $52.00. Sorry-no PayPal available for this item. Please email LonghouseJ@aol.com if you have any questions.